Between 2010 and 2012 the federal government ran a Solar School Program that provided grants for up to $50,000 for energy efficient applications to improve the use of energy in schools. 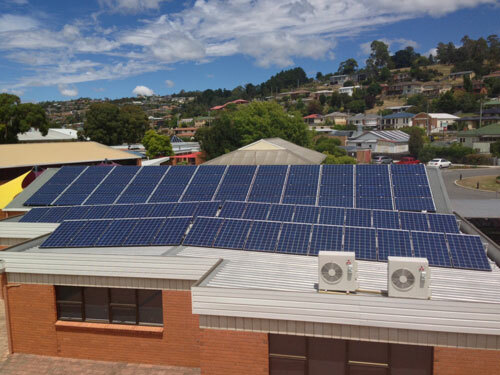 In 2012 Launceston Christian School (LCS) approached MODE to put together a single application of solar energy to maximise the efficiency provided by a large solar installation. LCS was successful in receiving the grant and the project went ahead. One of the requirements of the grant was for the installation of a web portal that students and teachers can access the usage data to monitor power generation and consumption in real time. We assessed various locations for the best direction, surface area and location to services. The panels were installed at an optimised angle of 30degrees facing due north. The system has been running for 15 months now and has generated 10% more energy than estimated due to smart installation design and high quality components. The inverter communicates to the Internet and the information can be viewed on a SMA Sunny Portal real-time web-based platform, and accessible anywhere in the world. This interface provides live information on system performance, power generation, school power consumption, faults, system settings and parameters. Student and teacher log-ins have been setup to provide educational outcomes and awareness of power consumption and the affect solar power can have on electricity consumption. The installation included a 20kW solar system with 80x 250W REC solar modules and an SMA STP17000TL 3 phase inverter. LCS has seen significant cost savings in its energy consumption. Even with the construction of new buildings and facilities, they have seen a 7% reduction in their energy costs since the installation of the solar system. This is a saving of over $6000 per year. They have also noticed that the base line power consumption of their school on weekends and during holidays can be generated by our solar system on sunny days.